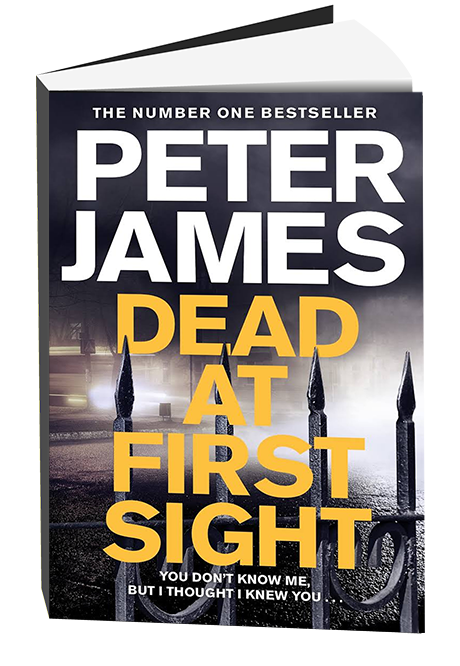 Earlier Web versions of this story, as well as the audio, included a description of a scene in one of Peter James’ books, and gave the wrong title of the book in which the scene is included. Any tour of Brighton, England, has to begin at the Royal Pavilion, according to crime writer Peter James. Built by a king for his mistress 200 years ago, its Taj Mahal-like spires are the city’s best-known landmark. James’ latest novel, Not Dead Yet, features — spoiler alert! — a pivotal scene in the pavilion’s dining room, with its one-and-a-half ton crystal chandelier. Without giving too much away — the book won’t be released in the U.S. until November – let’s just say it might have something to do with the aforementioned chandelier. “King George the Fourth was scared to sit under it because he was always worried it might come crashing down. And guess what happens in the book,” James says with a laugh. James lists his interests as criminology, science and the paranormal. He has worked in Hollywood, drives fast cars and has a house just outside Brighton and an apartment in London. In contrast, the tall, smiling man beside him seems to blend into the scenery. He’s former detective chief superintendent Dave Gaylor. And despite their different styles the two men are friends and, they would say, collaborators. James had been hanging out with local cops since the 1980s, picking their brains for his crime novels. “And one day one of them says to me, ‘Oh, there’s a homicide detective you ought to meet. Young guy. Dave Gaylor. You’ll find him interesting,’ ” James recalls. When James visited Gaylor’s office, it was total chaos. “It was full of blue and green crates, bulging with manila folders. I said: ‘Are you moving?’ And he looked at me with this sardonic smile, and said, ‘No, these are my dead friends,'” James says. Gaylor picks up the tale. In that first meeting, superintendent Gaylor explained that he’d been handed all the unsolved murders in the county of Sussex. Then he asked James what he was working on. “So I started telling him and he said: ‘Hang on a second. Wouldn’t your character have done this, and wouldn’t he have used an outside inquiry team to do that?’ And I thought: ‘Wow, this guy’s got real bandwidth,’ ” James says. And that’s how the fictional Roy Grace was born. A homicide cop for whom detection is like threedimensional chess. And though the character’s private life is fiction, many of his cases are based on Gaylor’s own experiences in Brighton, a city with a genteel appearance, but which has one of Britain’s worst murder rates and a long history of organized crime. From the Royal Pavilion, it’s on to The Lanes, a medieval maze of twisting, pedestrian alleyways that was once a den of thieves and pickpockets, James says. And in 1841, the railroad came. Today The Lanes are a dense concentration of antique stores and bistros catering to Brighton’s moneyed mix of university students and retirees, its vibrant gay community and young professionals of all persuasions. Here and there, though, there are hints of Brighton’s more colorful side. “This guy, thinly veiled, is appearing in my next book,” James says as he introduces Derek Laward, a jeweler in Brighton. “Derek’s been helping on research on the new book I’m writing right now, [and I’ve been] picking his brains a little bit about the dark side of Brighton,” he says. James and Gaylor continue their tour by heading uphill into a neighborhood of low Edwardian row houses and small shops called Pavilion Gardens. It looks respectable enough, but the men say the area is home to fourth- and fifth-generation crime families and has an active drug trade. How is he at bluffing? “Doesn’t give much away,” James says. “No, doesn’t give much away. I think that’s what helps in the books, doesn’t it, as well?” says the policeman. Something else that helps the books is a meticulous attention to forensic and procedural detail. James still goes out with Brighton police officers regularly. The science is changing so fast it has transformed detective work, James says, and he wants cops who read his novels to know he’s on top of that. Another Brighton landmark, the English Channel chews at a pebbly beach. There’s a panoramic view of the city’s rain-swept seafront with its elegant, cream-colored houses and expensive hotels. To James and Gaylor, these are crime scenes, real and imagined. The imagined can illuminate the real, James says, and can help us better understand ourselves and each other. He says this is why he writes crime novels. James writes a book a year. He hands one in, wakes up the next day and starts on the next one. With Gaylor’s help, of course. “We can sit and chat for an hour. Then he has to go away for nine months and write the book. So as far as I’m concerned, you know, I’ve got it made,” Gaylor says.